If you have read my prior posts on moldings, you may be able to tell that I am a firm believer in trim and moldings of all types, I believe they are essential to the beauty of a home. Window moldings, door moldings, crown molding, base molding, wall moldings, the more the better! During the building process of a home, we came to realize that we disliked the basic widow trim of our 2 story family room. The basic trim package that came with the home included the standard window moldings. Since the room was 2 stories and very large, the basic window trim got lost in the room and looked very bland. At the time, we didn’t want to spend the money to have the builder upgrade the window trim, we decided to do it ourselves after the home was built. Here are a couple pictures of the standard window moldings. After we lived in the house for a bit, the windows really began to bother me. I didn’t want to add curtains to the upper windows, I love natural sunlight and appreciated the grandness of these windows and doors. My style preference is to go light on curtains and let the beauty of the windows shine. We decided to replace and add 6″ trim around each window. The windows were so big and tall, we wanted the trim to come down the floor, which created a grand effect. We added plinth blocks to the bottoms of the side trim and keystone blocks to the middle of the upper window trim to really make the trim pop. We also added dental crown molding to this area. The two moldings worked perfectly together. I loved the results, it made such a dramatic difference. I added grommet drapes on the lower half of the doors for privacy. So now what to do with the bare area over the fireplace? 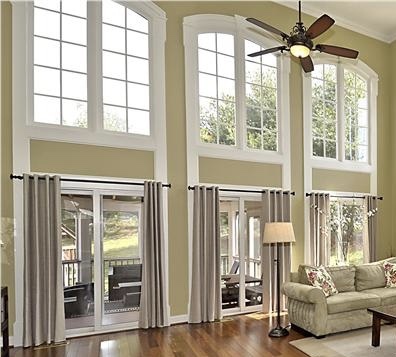 Add a 12′ mirror with similar molding as the windows. In addition, we added door trim around the entrance of this room from the kitchen, and trim around the see thru window which made a huge impact as well. If you are thinking about adding or replacing trim in your home, I say yes! Trim, trim and more trim! What are your thoughts? Drop me a line.